I received the Penhaligons catalog in the mail a few days ago. I have seen and bought from them at their Saks counter in NY, but had not seen the full range like shown in the catalog before. Penhaligons, is as they say, quintessentially English. Their line is wonderful, and wide ranging including not only the beautiful fragrances, but bath and candle products to match as well as sterling silver items and leather goods. The catalog itself is a beauty and worth looking through several times.It also details the history behind the company and calls the founder an alchemist. I like that. It can be asked for via their website. 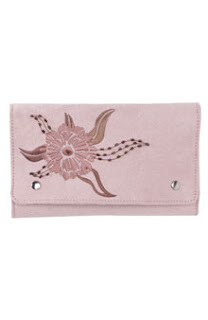 In the Mother's day gift mode, and for many other wonderful gifts, you would do very well giving something from them. Their rose fragrance Elizabethan Rose is a pretty, straightforward rose. If one like rose, they will love this. 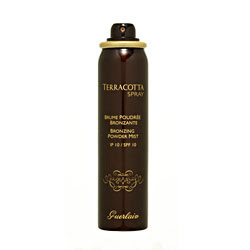 It, as many of the scents do, comes in perfume, soap, powder, body wash, and lotion. Violetta is one of the loveliest violets, soft, and beautiful. Lily of the Valley is totally Lily, very fresh . It is also the flower of May. The list of scents goes on , Ellenesia is a standout, and for non floral look to Malabah. The prices for the ancillary bath products are prieced pretty well , and are packaged really nicely. The line also has the most elegant candles. I can vouch for the wonderful fragrances, but I have not tried the candles, just admired them. The tops or conatainers are silver plated and they can be refilled. 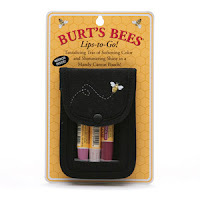 Burts Bees Lips to Go. A great budget gift. 3 lip shimmers in a pouch that has it's own mirror. On sale now at Drugstore.com for 9.09, regular retail 12.99. I have seen this at Target as well. "Collectors (as well as fans of lily-of-the-valley’s delicate green scent) take note: on April 28, just a few days before May Day, when the French traditionally give each other gifts of lily-of-the-valley, the House of Guerlain is launching a limited-edition, exclusive perfume, Muguet (lily-of-the-valley), in a re-release of their quadri-lobe crystal bottle from the Verrerie Royale de Romesnil – created in 1776 and no longer in existence. Muguet will be available from the Maison Guerlain on the Champs Elysées, as well as in the other Maisons Guerlain worldwide (Neiman Marcus, San Francisco; Bergdorf New York and Toronto)." No word on price, call Jason at Bergdorfs for more info. I don't plan on getting one, but I want one . Spring is here, and so almost is May. This means Mother's day is coming soon. I wanted to put together some solid, great gift choices. The fabulous blog Now Smell This has done several posts on this same subject, all fragrant choices, and I don't want to repeat any of hers. Head to the site to see her great ideas. I will add more here, most beauty oriented, and in all price ranges. 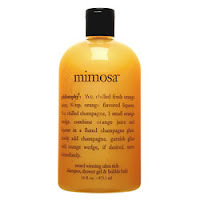 Philosophy 3in 1 shower/bath gels. These are amazing, and really smell like the real thing. These are a treat for any mom, but I think of new moms especially. I know friends ( the Movie Mommy blogger for one) who were so happy just to shower when they had newborns. It was a feat. They also didn't go out much. The cocktail flavors of these gels can give them a boost, and make them think of evenings out as well as having a fun shower/bath experience on the run. New moms need love too. 16.00 each at sephora, nordstrom. More gift ideas next post. I had the good fortune to receive one of these Claus Porto from Lafco NY Candles in the Mimosa( Lysia) scent. Smelled in the jar it was a beautiful flowery mimosa, bright orange in color. Lovely. I am not always a fan of floral candles, but this was too pretty not to burn, and I had always heard great things about the Claus Porto Candles, but have never used one. What a wonderful candle this turned out to be. The scent is fabulous, a bright mimosa that floats through much of the house. It has great throw and really strong scent. It's so pretty and really made for a cheery smell throughout. The candles are soy blends, 10.5 oz. and created by Lafco NY ( a great store) for Claus Porto. the website states burning time at about 70 hours. They retail for 32.00 each and come in many scents. Mothers Day is approaching soon , and while a great treat for yourself, these also make great gifts. In case an Ulta Store catalog didn't get to you, there's a really good nail deal going on there. China Glaze nail polishes are buy 1 get 1 free. They retail for 6.50 each. Now, I don't see buy 1 get 1 too often on higher end nail polishes. I tried China Glaze for the first time back in December, and really liked it a lot. I also happen to have a 5.00 off 10.00 purchase coupon for Ulta, so ostensibly I could have 4 China Glazes for 8.00. Not that I would, like I need more nail polishes, and I could always get 2 polishes and some other things. I had the pleasure of meeting perfumer Neil Morris at the fragrance sniffing event I went to in NY a few weeks ago. He was also part of the group . Neil is a Boston based perfumer, and has launched his new line Neil Morris Fragrances. Neil is also an incredibly nice, warm guy, who clearly loves what he does and all things perfume in general. He happily passed around test strips of his scents to us, then sent us off with samples of our choice. I have to say that pretty much all the fragrances were quite nice. The samples I got were Midnight Flower, and Zephyr( did I mention they all have great names too?). I have been able to wear these and try them out longer. Midnight Flower is a slightly powdery, somewhat old fashioned seeming, red fruit floral- not that too sweet fruity floral, just a nice blend of them. 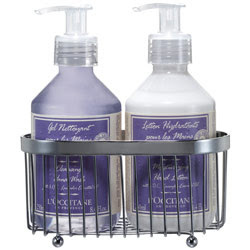 The notes include Sweet Orange, Gardenia, Fig infused with Green Tea, and Musk and Patchouli. Zephyr is a burst of citrus scented air that blows by you. ( and I thought that before I read Neil's notes that it was inspired by just such a breeze).It has slightly ozonic notes to me, and that could be from the Ocean Musk in the notes. It is refreshing, then becomes a bit more fruit and gourmand like. I think thats the white tea coming out. I like it a lot, and these all have good lasting power. 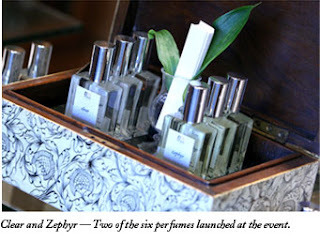 The other nots in Zephyr include Tangerine and Papaya, Honeysuckle ,Casblanca Lily, Sandalwood, Amber. Neil Morris's fragrances were well received by many in our group and some have gone on to purchase them. Ralph Rocks is the newest fragrance from Ralph Lauren launched a couple months ago. This is another great for summer fragrance. The tag line says it's for the rebellious , independent and free spirited. In other words- just try it, it may be you. The fragrance begins a bit like a creamsicle then the amber comes along, with orange blossoms and a touch of vanilla, which must be the whipped milk accord the notes list. 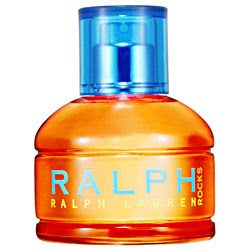 Ralph Rocks is a very sunny, fun , warm perfume. It's a bit floral, a bit fruity and a touch gourmand. It's an ambery -coconut scent in a bright orange bottle that says Summer. At the Ralph Rocks official website you can listen and download songs by Scottish singing sensation Paolo Nutini, as well as get more info on the fragrance. I love, love this manicure. It's so Chanel. This comes from the photos in the new Sephora Mothers Day catalog, and online. They tell you how to do a DIY , but I can't come close to that on my own. I rarely get manicures, but next I do, this will be the picture that goes along. What is the smell of fun—and how do you bottle it? That was our mission at Bond No. 9 when we decided to capture the essence of Coney Island and turn it into an eau de parfum. Why Coney Island? We were intrigued by the vintage allure of this century-old fantasy-land with its honky-tonk chic, its Mermaid Parade, its incomparable hotdog haven (Nathan’s Famous) fronting the Atlantic Ocean along Brooklyn’s southernmost edge. 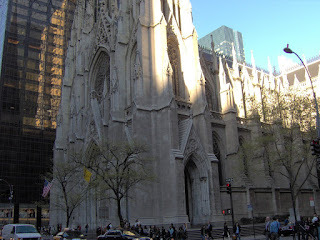 But we wanted to celebrate its future, too, just as a formidable revival is getting under way. Coney Island isn’t just any amusement park. In its early 20th century heyday, New York’s premier people’s playground was a rowdy, mind-numbing pleasure-mecca that more than matched the energies of the city that contained it. Its daredevil rides—the legendary nine-hill Cyclone roller coaster … the Wonder Wheel … the freefall Parachute Jump—set a fevered, frantic pace, while its bathing pavilions were more like phantasmagorical gilded palaces that shimmered in the air. Not to forget the raucous nightspots. For a city that where glancing at strangers for more than two seconds has always been an impertinence, here was an escape hatch—a Bacchanalia where one and all had free rein to scream together in terror and joy. Sure, in recent decades Coney Island fell into decline, but today it is decidedly on the upswing, with brand new rides, a water park, and a mammoth glass atrium in the works. Bond No. 9’s Coney Island is sold at all four Bond No. 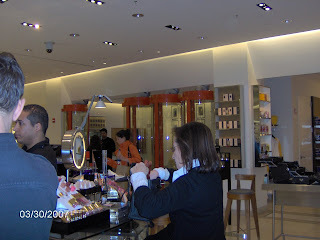 9 stores, at selected branches of Saks Fifth Avenue, and at Harvey Nichols, Harrods, Paris Gallery, Lane Crawford. Besides being available in its 3.4 oz. artist-designed superstar bottle and box presentation ($180), 1.7oz travel size ($125), Coney Island may be purchased by the ounce ($40), either in a 2-ounce basic spray flacon with gilt honeycomb cap ($25) or in our unique our unique vintage or art bottles, featured in a wide variety of designs ($60 - $200). I am happy to have 2 Jo Malone products to rave about. 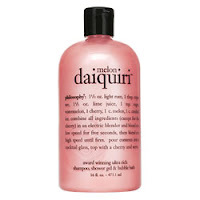 I had previously sampled 2 very popular fragrances Grapefruit and Pomegranite noir and they were just not me. Recently I got samples of both the new Vitamin E Hand Cream and Orange Blossom cologne. Now I see what makes this line so loved. The Hand Cream- Very moisturizing and very quick absorbing, I have been trying to make my small samples last . This has very little scent , so will not interfere with fragrance, but gets the job done. You can apply any time, and then go abut what you need to do, no greasy hands. An elegant way to keep your hands looking the best . Orange Blossom Cologne- This is tart and zingy, then beautful orange flower blossoms and lily. A citrus floral that is really all seasons but will be especially nice in the warmer weather. It being a cologne ,you can be a bit freer with applying and re- applying. It's a very uplifing scent that also comes in candles and bath products. The fragrance of this would be welcome in any of those. The candle must be wonderful. After I use my samples up, I would definitely consider a purchase. So far, the best Orange Blossom I have tried. It's not too early to think about Mother's Day, and these would make a great gift. I have been able to test 2 samples of CB I Hate Perfume, Wild Pansy and To See A Flower. These are my first experiences with this line apart from a quick sniff of some in NY. CB I Hate Perfume is the fragrance line of Christopher Brosius. He creates these fragrances in his studio in Brooklyn. He is also the original founder of Demeter fragrances. Brosius has an uncanny way of creating a scent as unbelievably close to real as possible. His notes are spot on. Wild Pansy is exactly what you would smell if you planted a pansy in your yard or planter, and immediately stuck your nose into it to take a sniff. It is dirt, green , and potted plant. It is outdoorsy but floral. As it dries down it becomes a softer skin scent and a quiet floral. To See A Flower should perhaps be called To Smell A Flower. It is walking through the garden just after a light rain or as the dew has settled and began to dry as the sun hits. Cut flower fresh , and garden-like at the same time. CB's website describes it : Delicate spring flowers (hyacinth, daffodils, jonquils & crocuses), green shoots, wet dirt & a bit of moss. I would love these to last a bit longer on. They come in perfume accord that I tried, as well as perfume water. To See A Flower also comes in home spray. 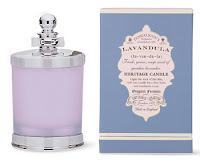 The website lists many other unique scents as well as accords like crayon, ice cream cone and hay( and he quotes George Sand to boot). Winter weather is still here in most places, so we are still needing many of the winter items to keep us going through the chill. 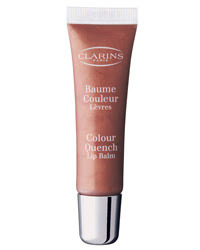 One I found for Christmas and haven't posted about it Clarins Color Quench Lip balm. This is not only a pretty lip product but a really good one as well. Super moisturizing with shea butter and vitamin E. It also is a gloss with great shine, and a great fruity taste. Since I have been using this , I have been able to cut back on almost all other lip balm applications and that's with only 1 application a day even. With the medium sheer color and gloss it can go on anytime. I have it in bronzey shade. This will go into warmer weather as well. Color Quench comes in 15 shades ranging from very light to very bright. It really keeps the lips from getting chapped , and since the wind is blowing here in the northeast, this is good. In this time of rebirth and celebrating, I thought I would share a good deed that came to the friend I was with in NY for the weekend. I want to send a big Thank You to this person . Not only did she do a really good thing, but she raised a child who also wants to do a good thing. It would have been so easy for anyone to take the bag. Literally hundereds of people walked by. Good deeds still exist, I think we are happy to note. Had to pick up something at Sally Beauty today . I don't get in there often, and I found this little gem. I could not seem to get a good shot of it, but it's a nail polish from their own Sally Girl line. It's really neon fuschia purple ( more purple) called Type A. Perfect for summer pedis and nails. It's tiny and cost 95 cents. CB I hate perfume : The new Cradle of Light is a beauty, a complex beauty. It is a white floral bursting with jasmine, but is not floral-y. It is not pretty per se. More deep and green. Very different. It has 5 different jasmines as well as the other flowers. It is one of the most expensive in this line, and a very interesting fragrance. I also got samples of Wild Pansy and To See a Flower, which I plan to review later. Wild Pansy is very green, dirt encrusted floral. and yes that actually is a nice scent it seems. Annick Goutal: I have an up and down thing with Goutal perfumes. Some I like, many I don't. Neroli is a nice enough perfume, but it isn't special or unique. It reminded me a lot of L'Occitane Feuille De Oranger. Neroli is less unisex and more floral, however. There is also a new Eau D'Hadrien Body cream out to celebrate the anniversary of this fragrance. I would have liked to try that but didn't even think of it. Corrections: yesterday I mentioned the new Darphin fragrances. I now have names. Lilas Jasmin, green tea-capucine( which is actaully much nicer than I would have ever thought) and Mandarine Menthe ( refreshing). The Chantecaille Corail Compact in the fancy version is not 550.00 but 420.oo I think. Not that I anticpate a buying rush over this. The store didn't even have any to sell if you did want it. Thanks to all the great people I got to sniff with in the city. A great group who all love beauty stuff and do not care what you do , or how much money you have. Non judgemental fun. More on the NY weekend finds. Frederic Malle: Luis , the counter manager is a total sweetie. We got to try the famed Scentports. 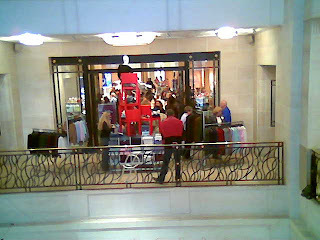 They are the red tubes in the picture at left. I didn't want to take a picture right there , so this one is a bit farther away. Luis said that there will be a new release in fall from the line. Try as I might, I couldn't get too much info out of him, but he did say that it will be a darker fragrance, and not floral. Darphin: I did not know that Darphin had released fragrances. They have 3 and they are quite lovely. I couldn't find them on the website even, and do not remember the names. One was a lilac blend. Very airy and light and pretty. One is tea and a coffee note . Again, really nice. Very green tea more than anything. They retail for 75.00 for 2 oz at Bergdorfs. Mayotte , the fragrance is a sort of new release from Guerlain. It was Mahora , and now is the same fragrance with a new name and in the bee bottle. This is a great frangipani based white floral. I was and am a fan of Mahora, but it didn't find an audience at the time. Maybe this time it will. Iris Ganache is the new Art et Matiere fragrance. Not out yet, but a tester was available. I liked this, and was unsure due to the ganache chocolate note. It a light iris with a hint of ganache. It was the first frag. I tried so my memory of it is not of all the notes, but an overall one. It is very nice, but not overwhelmingly new or interesting. The fact that it is light was good, but it's not a full bottle fragrance. I also tried a lipgloss and loved that. Would buy that. Nice color and quality. Ok thats todays post. I will have more tomorrow. Spent the weekend in a fragrance and beauty product extravaganza. I have so many things to write about and will take the next few days to post some of them. It was a nice Spring weekend and I was able to go to so many great stores and try new things. Many I have sampled and am ready to give impressions on. One of the highlights was Bond 9. I got to meet Laurice Rahme, the owner and founder, and a lovely lady. 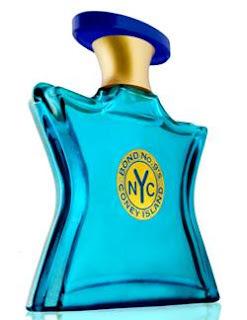 She gave us a sneak peek at the new Bond 9 summer fragrance Coney Island. Save your pennies up, because this is one great fragrance. The notes are meant to be reminscent of a Margarita. It really does smell like that with other notes mixed in to give depth. Superb. It will come in a blue bottle as pictured here. She also hinted at a Gardenia perfume that may be coming in fall. 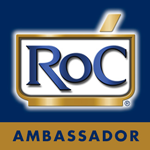 I will have info on upcoming products, on some of things I have posted on here before, bath products and more. Off for the weekend. 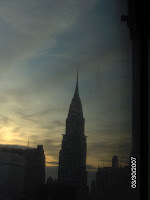 Will have a new post late Monday. I will be sniffing all the new fragrances this weekend, and will have info and reviews on lots of them, including Bond 9, Annick Goutal Neroli, and more.